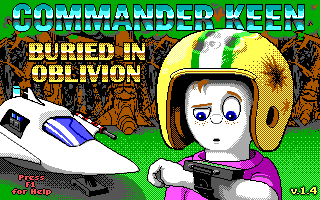 You will need DosBox to play this mod. Run via 0blivion.bat. No further files or setup are needed. A new year, an updated board, an old initial post and some even older level designs. A perfect time to celebrate some good old, but nearly forgotten, Keen 4 modifications. The idea of this Levelpack came way back in the day (2011). This compilation is a revision of numerous different level designs, which were originally created and published by several people of the PCKF. Some as single levels, others within a package of a couple of levels. Quite a number of them were unfinished or even abandoned. The motivation of this all-in-one levelpack is to celebrate such ideas and bring them back to life. Therefore some polishing has been done and an embedding little plot has been written. So here they are: The Lost Tapes, Buried in Oblivion. First and foremost I sure would like to thank every one involved with either development, testing or simply donating one thing or another. At long last (started this effort in 2012 but unfortunately lost all data along the way), I can finally make this post. and I hope you enjoy. This community pack is the product of the work from many people since 2003 till today. Everything is kept as close to the originals as possible. Revisions have only been made when needed, eg. some candies have been added, tile misplacements got fixed and a few minor things were done, to make things more playable. I look forward to hearing your thoughts and feedback. In particular, let me know if you find anything in the level design that you think might benefit from something like a difficulty reduction, more ammo, etc. I'll take all suggestions into consideration. Depending on your feedback, I may be doing some similar effort on Keen 5 or even Keen 6 materials in the future. I also want to share an extras folder containing various development files. For Credits, special thanks and information consult the help section titled "About" (press F1 to access this menu). Last edited by Nisaba on Wed Oct 10, 2018 11:22, edited 10 times in total. Challenging, but I love it! I am very glad to have worked with you on this project! I hope my contributions were, uh, at least mildly acceptable, and I wasn't the meanest editor in the world. Neat! I remember you asking about using some of my old levels, but this is far more intricate than what I expected. Had a chance to play through this, and there are some very clever and unique levels, especially the new ones you've provided. I like some of the other subtle changes too, such as the real rocks and mimrocks now being indistinguishable based on their elevation off the ground. I'm glad you were able to salvage the least awful levels from my old levelpack. I don't think they fit with the rest of the levels in terms of quality, but maybe someone will find some fun in their absurdly confusing design. One minor immediate foob is the Game Over each time you die; at least when you initially start playing. This forces the player to restart the entire mod over, which is tedious, especially on harder difficulties. You can play this with Commander Genius 1.9.8.1 or later. Enjoy! and thanx for the feedback. Gridlock wrote: I'm glad you were able to salvage the least awful levels from my old levelpack. I don't think they fit with the rest of the levels in terms of quality, but maybe someone will find some fun in their absurdly confusing design. Well, in my opinion they are balanced in reference to some more linear levels near by (macro-progression) (Hillville vs Pyramid of the forbidden). Plus I found those little puzzles of yours very entertaining. the backtracking can get a bit confusing, but not too much to loose the fun. and btw: I learned a lot by analyzing your level designs. when it comes to keys and doors placements plus the usage of space, there is whole lot to study and adopt from your way of organizing things. ... how to design levels in a unique but amusing way. ... what to do to in order to keep the players interest high. ... how to lead the player's attention. ... follow a theme in a limiting way. Levellass wrote: One minor immediate foob is the Game Over each time you die; at least when you initially start playing. This forces the player to restart the entire mod over, which is tedious, especially on harder difficulties. btw, learned a whole lot about patching while doing this levelpack. thanx again for your support. oh that is beautiful, thanx very much for the effort! I love to see this little levelpack to work on different platforms too. nice! That's why we play video games rather than real life games. I'd be interested in other Keeener's opinions of this. I'd vote for three lives. It's like real life in that it makes you realize just how important it is to get a life. 122 minor tile issues found, probably not worth fixing. * Keen can then shoot it off onto the bottom of the level. Strange, not sure if images show to anyone else, but here's direct links. thanx for pointing out these 122 minor tile issues. Wormouth and Mimrock mentions are known issues. I'm not sure how to handle these Wormouths, they are so snappish and headstrong. Mimrocks... ach... they love to come to the fore. I was playing with giving them a foreground behavior of 2, which makes them do strange things in other places. since they must blend in with rocks, I cannot let them appear behind of of solid ground. any ideas on that? And I cannot change aspects of this level even more, since the author of this very level didn't like me doing even more changes to it as such. BTW, images are displayed quite sleek over here. Last edited by Nisaba on Sun Jan 15, 2017 15:54, edited 1 time in total. Woah! Despite all the tile bugs, this is the second best level/mod Keen 4 pack I've ever played! Very well done! I really liked most of the levels. The difficulty is fine, except for the later levels, but I guess that's fine. Thanks for that pack to all contributors! So this is what treasure eaters do after they stole from you. The gallery level is awesome.